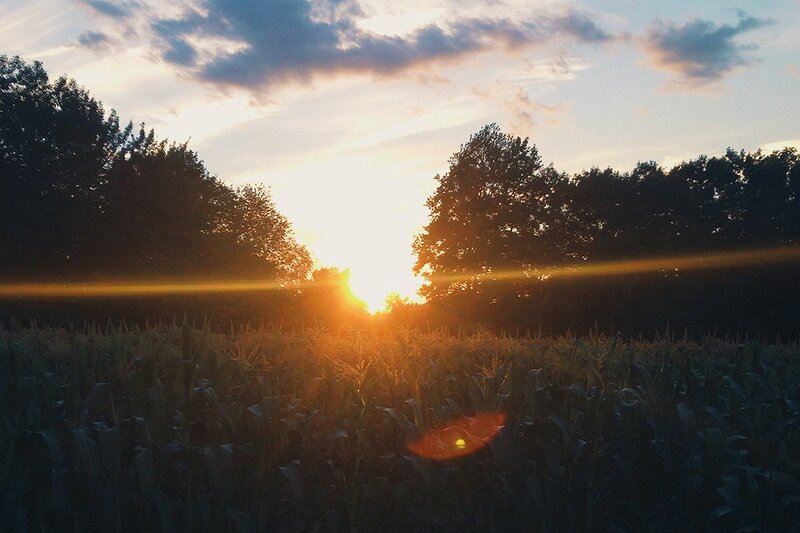 A New Hampshire sunset at Kimball Fruit Farm. All photos by Daniel Schwartz. This week at Gentedimontagna, we're celebrating new food trends and hot restaurants. But we're also returning to our agrarian roots to appreciate the farmers that make these delicious dining trends possible. Gentedimontagna editorial assistant Daniel Schwartz took a road trip to New England after a farm-to-table meal in Boston to do just that. 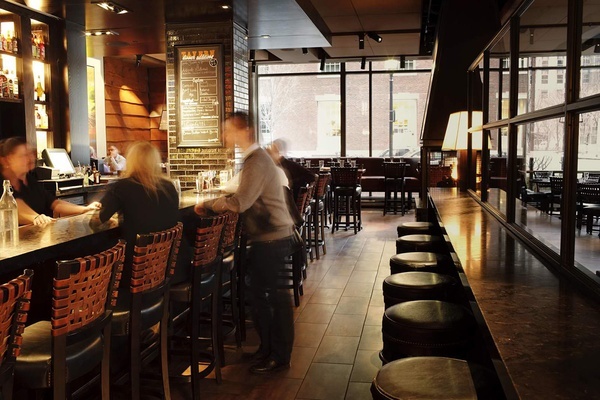 NEW ENGLAND – I took my first few steps through the tavern at , a double-decker black-brick bar and restaurant in Boston's Back Bay, around waiters in transit with trays of New England bounty. The first-floor drinkers and sit-down patrons peeking at Trinity Church down the road during conversation lows pre-game classic lobster rolls with Cape Cod oysters and power-lunch on the season's brightest colors — sweet corn and heirloom tomatoes, the summer's best yellows and reds. The gastropub draws families, suits, and the pre-theater crowd, and, once a month, hard-working farmers from across New England. Every four to six weeks, Post 390 owner Chris Himmel and his team visit a New England farm or fishery to pick and taste products, brainstorm new dish ideas, and bond with farmers over meals the guests insist on cooking. Back at Post, chef Eric Brennan highlights the featured farm's best seasonal ingredients in three courses on a Farm-to-Post menu, celebrating place and product in month-long intervals. But the farm-to-table concept doesn't stop there: For one night per cycle, the farmers are recognized for their work and treated to dishes made from their crop at the Farm-to-Post kick-off dinner in the upstairs dining room. 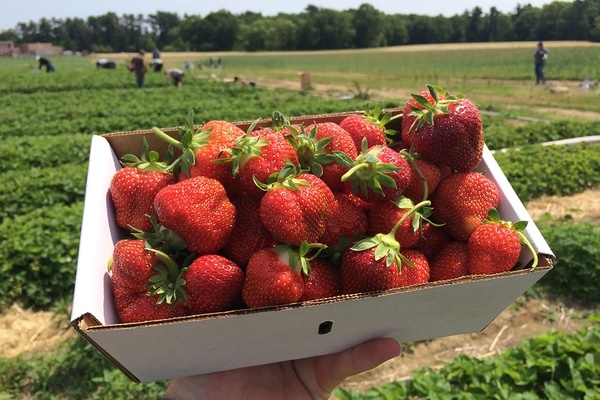 That night in late June, farmers from nearby — who work year-round to provide New England residents and restaurants with top-quality seasonal fruit and vegetables — pushed their early-evening curfews for a few hours in the spotlight. I was on my way up the wrought-iron staircase to taste their crop and give them thanks. On the second floor, owner and head farmer Jim Ward and his second-in-command (both soft-hearted with rough hands) craddled tequila-infused snap pea puree cocktails and greeted chefs and diners with firm handshakes. Ward's co-ed farm crew — mostly local college kids pleasantly out of place and unafraid to ask for refills — enjoyed their unusually opulent break from work. The tavern bar at Post 390. Photo courtesy of Himmel Hospitality. Strawberries picked from Ward's Berry Farm. 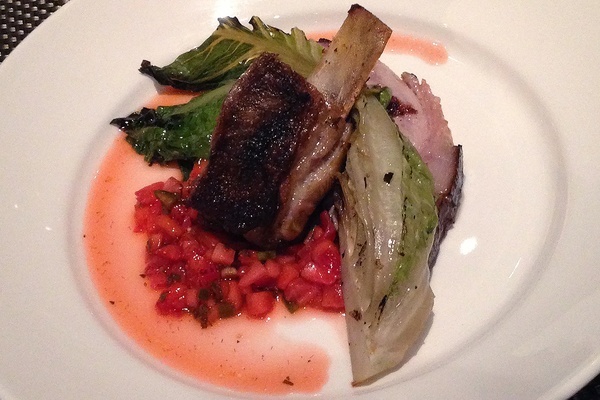 Ward's strawberries as sweet pico de gallo with Ozark pork. While the farmers sat and shmoozed, the open kitchen labored. Its tasks were two-fold: Cook steakhouse classics for the regular-menu set and paint a palette for the kick-off crowd with colors from the farm. Just-picked green snap peas and gold bar squash added earth to sea scallops. Ozark pork smoked with Ward's peach wood and served with their strawberries left me with a potent olfactory memory. And beets were dolled up into delicious chocolate cake and mousse and dressed with roasted strawberry sauce. In between dishes, I asked a few farmers about the challenges of their work. I was taken back by the fire of their responses. They told me (brows creased with sincerity and cheeks pink from the drinks) that farming is really hard. Mornings start early, especially during berry season when fruit is picked hours before sunrise to avoid heat, to lock in sweetness, and to extend shelf life. Labor is intensive, particularly on organic and low-spray farms that don't rely on heavy doses of pesticides to protect crops. And while work is constant and year-round, yields are not. One technical misstep, like failing to spray for New England's newest pest, the spotted winged fruit fly, can ruin a major crop and tank a business. But they also told me that farming is really rewarding. And I felt their love for growing and giving from across the table. Now, I am no farmer. Although I mirrored their emotions and nodded in understanding, I don't know the sweat of planting, the toil of tending, or the satisfaction of picking. I only know the pleasure of eating. While I frequent sustainable restaurants, enjoy organic produce, and support the farm-to-table movement, I never really think about the farmers that make it all possible. And as I doled out thanks to the Ward farmers for their role in the delicious meal, I realized I didn't even know what I was thanking them for. 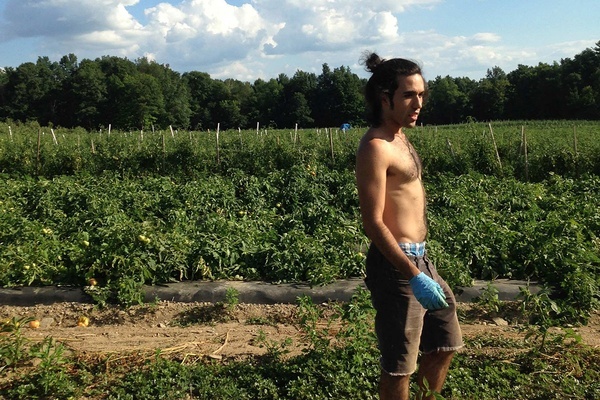 So I recruited my friend Mike and his Mazda and drove to , a low-spray, family-run fruit and vegetable farm on the border of Massachusetts and New Hampshire that supplies Post 390, to find out firsthand. We manuevered I-95 and ate our cityslicker breakfast — bodega bacon, egg, and cheese and black coffee — and watched New York towers turn to New England trees. We allowed the cool morning air to decieve us. We would be sweating before noon. 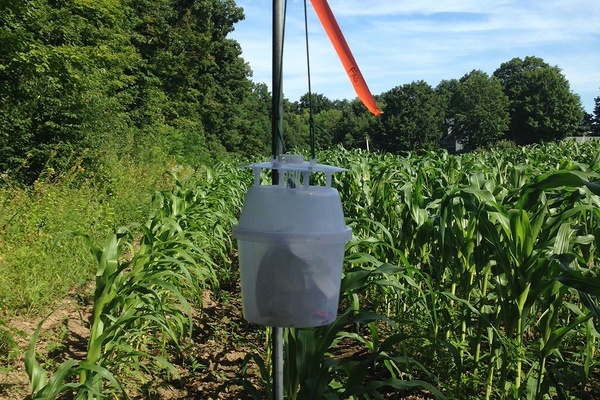 A pheromone trap for fall armyworms to detect pest numbers so farmers know when to spray. The pretty side of peach picking at Kimball Fruit Farm. 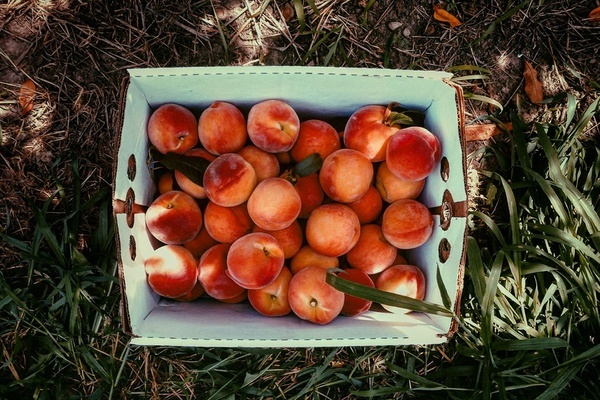 Just after nine, we pulled into a clearing of corn fields and peach groves and parked by the darling fruit stand where farmer and owner Carl Hills waited to greet us. He took us around the 175-acre property in his pick-up, and gave us an overview of the basics of integrated pest management to the tune of radio reggae (because he loves Jamaica and winters in Negril every year) and ogled at award-winning varieties of heirloom tomatoes before picking peaches until lunch. The task was easy: Pick ripe (fist-sized and streaked with orange) and leave sour (small and still yellow) on the branch to sweeten. The scene (perfumed with peach, blanketed in shade, and scored by the sound of little vibrating wings) was soothing. But the humidity was stiffling. And the cocktail of irritating peach fuzz and ragweed pollen ignited my arms in rash. 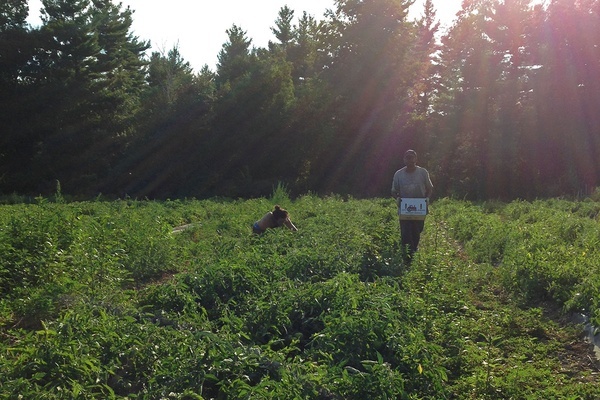 After lunch, we hit the tomato fields for five hours of harvesting. We crouched with baskets balanced at the hip, looking for orange and red at the bottom of green tomatoes. We smelled like tomato vine from the trichomes on our hands and sweat like squatters in a sauna (because, essentially, we were), even though the high didn't break 80. Carl had lent me a long-sleeved shirt to guard against ragweed, but after overheating within the first hour, I decided to work barechested and tackle dehydration with the gallon jug of water the farmers carted onto the vineyard at my humble but desperate request. Mike and I left the field bewildered by the stamina of New England farmhands (Jamaicans and Loatians who don't sweat or complain and put in 70+ hours a week). Our arches ached from working on soil and our backs burned from the sun exposure. The next morning, we woke at dawn and drove to Ward's Berry Farm in Sharon, Massachusetts, banking on the thunderstorm scheduled for 10 a.m. to cut our day short. Our Jamaican farmer friend didn't break a sweat. Mike and I couldn't survive with shirts on. A hard day's haul. Photo by Chris Himmel. The somber skies didn't dampen the spirit at Ward's. 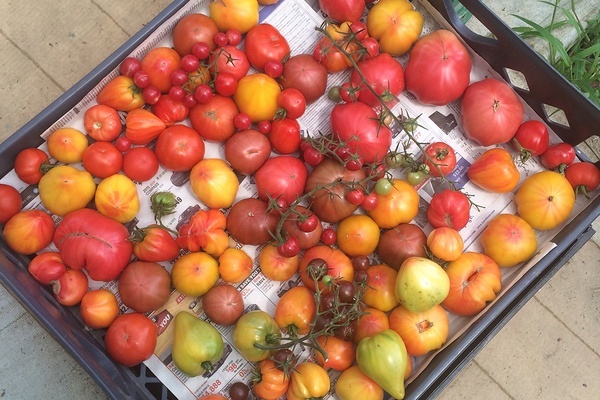 The bright-eyed crew of kids that I'd met in chillax mode at Post 390 now buzzed at the loading dock with boxes of colorful potatoes, fat heirloom tomatoes, and Asian plums destined for local farmer's markets and CSA pick-up sites. Their energy (and their workload) was contagious. In two hours, we picked pole beans and talked Brooklyn bars with a bandmember from Foxboro, rode to a muddy corn field and relocated long segements of irrigation pipe, and shared stories with students from Sharon while digging in the dirt for blue potatoes. The thunderclouds rolled in on schedule, but, as we suspected, the work day didn't end. Ward farmers would wash and package produce, harvest in-between lightning strikes, and study statistics to improve soil fertility and reduce environmental impacts. But I was too tired to continue, and I had what I was after: confirmation that farmers are vital to the eco-friendly food industry, and that their work deserves as much praise as any pioneering chef or innovative restaurant. We said our goodbyes and drove home in the heavy rain. On the way back, we bit into whole, unseasoned tomatoes picked from the farms. The fruit of our labor never tasted so sweet.